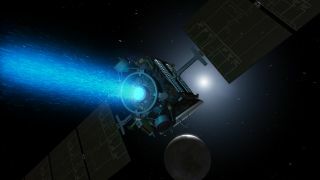 This artist's concept shows NASA's Dawn spacecraft above the dwarf planet Ceres in early March 2015, when the spacecraft arrived in orbit around the dwarf planet. Image released April 6, 2015. One month after its historic arrival at Ceres, NASA's Dawn spacecraft is preparing to begin its intensive investigation of the dwarf planet. "After it entered orbit, the spacecraft's momentum carried it to a higher altitude, reaching a maximum of 46,800 miles (75,400 kilometers) on March 18," officials wrote in a mission update Monday (April 6). "Today, Dawn is about 26,000 miles (42,000 km) above Ceres, descending toward the first planned science orbit, which will be 8,400 miles (13,500 km) above the surface." Dawn has not been taking pictures during the descent thus far because the probe has been on Ceres' dark side. Dawn will capture some images on April 10 and April 14 for navigation purposes, but the best photos won't start rolling in until the science campaign starts. "By early May, images will improve our view of the entire surface, including the mysterious bright spots that have captured the imaginations of scientists and space enthusiasts alike," NASA officials wrote in the update. "What these reflections of sunlight represent is still unknown, but closer views should help determine their nature. The regions containing the bright spots will likely not be in view for the April 10 images; it is not yet certain whether they will be in view for the April 14 set." The $473 million Dawn mission launched in September 2007 to study Vesta and Ceres, the asteroid belt's two biggest denizens. Vesta is about 330 miles (530 km) wide, and Ceres' diameter is estimated at 590 miles (950 km). Both Vesta and Ceres are intact protoplanets left over from the solar system's early days. Studying them should shed light on the long-ago planet-formation epoch and reveal insights about how Earth and other rocky worlds are put together, mission scientists have said. Dawn's instruments and other systems are in excellent shape, NASA officials said. If all goes according to plan, the spacecraft will study Ceres from a series of increasingly closer-in orbits until June 2016, when Dawn's mission will come to an end.